On Monday November 27th, 2017, Student Representative Council (DPM) and Student Executive Board (BEM) of Faculty of Engineering UMY held the inauguration of the period 2017-2018. The inauguration was held in the Stadium General room building F1 in the 2nd floors Faculty of Engineering Universitas Muhammadiyah Yogyakarta. 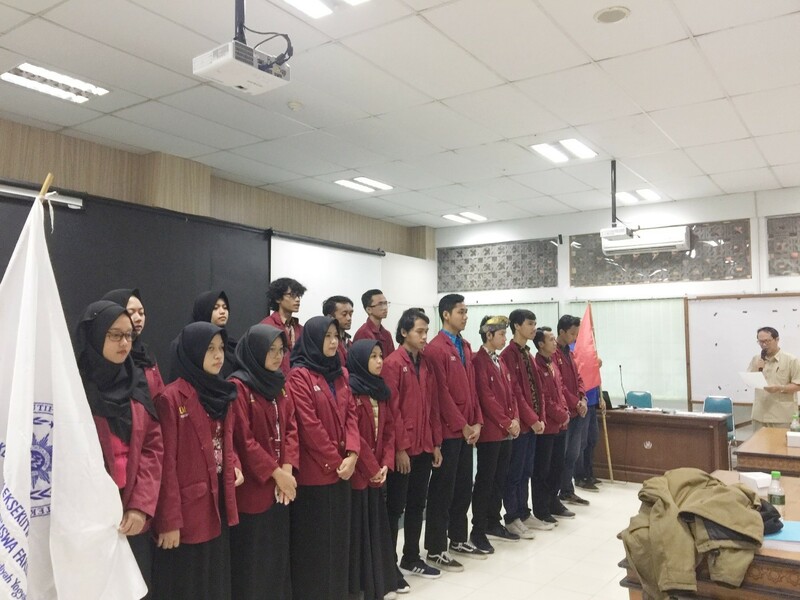 The series of inauguration ceremony of the Student Representative Councils and Student Executive Board of Faculty of Engineering UMY is opening, Reciting the Holy Qur’an, singing Indonesia Raya and Mars Muhammadiyah songs and followed by inauguration of Student Representative Councils and Student Executive Board period 2017-2018 led by Vice Dean of Resources and student affairs, Ir. Aris Widyo Nugroho, M.T., Ph.D. Several members of Student Representative Councils and Student Executive Board of Faculty of Engineering UMY in the previous period or could be called the demisioner (outgoing) also attended the inauguration event this time. In addition to attending the invitation, one of demisionaris (outgoing) of Student Representative Councils and Student Executive Board also gave a speech and advice for the management of members of Student Representative Councils and Student Executive Board period 2017-2018. Chairman of Student Representative Councils and Student Executive Board Governor of Faculty of Engineering selected for the period 2017-2018 also conveyed the preface. Muhammad Bagas as Chairman of Student Representative Councils Faculty of Engineering said that Student Representative Councils of Faculty of Engineering period 2017-2018 ready to accommodate the aspirations of students of Faculty of Engineering UMY. Vice Dean for Resources and Student Affairs Ir. Aris Widyo Nugroho, M.T., Ph.D also expressed his gratitude for all the performance of Student Representative Councils and Student Executive Board of Faculty of Engineering in the period 2016-2017. It is expected that all new Student Representative Councils and Student Executive Board Faculty of Engineering can always improve soft skills in terms of cooperation, creative and solutive. It is important that students have discipline, empathy and organizing skills that can be used in the workplace, therefore the opportunity to organize this should be utilized as well as possible added.